Orange trees are susceptible to numerous pests and diseases, including fungal diseases that affect all parts of the tree. Most fungal diseases can be controlled with applications of copper fungicide at the rate and schedule recommended by the manufacturer. Proper cultural practices, such as regular irrigation and fertilization, can help prevent fungal and bacterial diseases on orange trees. Plant the trees in full sun and well-drained soil with adequate air circulation. Damaged or diseased limbs should be pruned and destroyed to reduce the spread of disease. Fruit infected by citrus scab may grow distorted, but the fruit is still edible. Initially, corky growths appear on infected fruit, foliage and shoots. The growths eventually crack and turn yellowish-brown and then gray. Citrus Scab is caused by the fungus Elsinoe australis, and can be treated with copper fungicide. The fungus Cercospora citri-grisea causes greasy spot disease. Yellow spots appear on the upper surfaces of the leaves, followed by irregular brown blisters on the upper and lower surfaces. The blisters become slightly raised, turn dark and appear greasy. 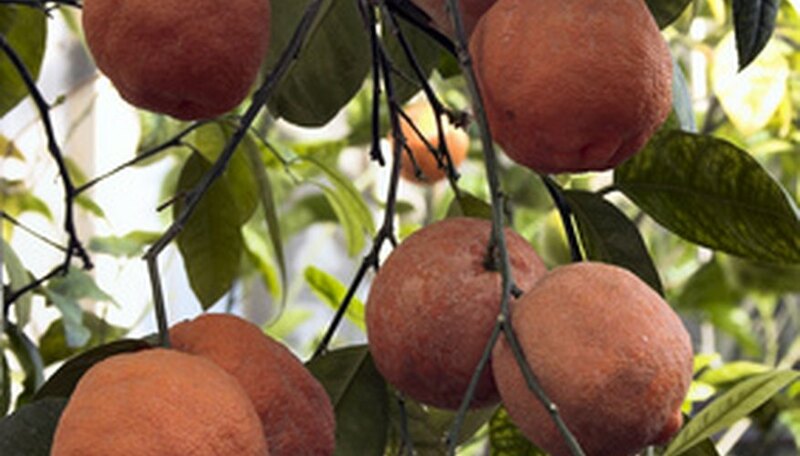 Leaf drop caused by Greasy Spot can weaken orange trees and lead to reduced fruit production. The disease can be treated with copper fungicide in combination with horticultural oil. The foliage and fruit on orange trees are affected by Alternaria brown spot. Brown blotches or spots with yellow margins appear on the foliage and the leaf veins turn black. Slightly sunken dark brown or black spots with yellow halos appear on the fruit, which then drops prematurely. Alternaria brown spot can be severe on orange trees, but it can be controlled with fungicides. The fungus Phytophthora causes root and crown rot in orange trees. The roots turn black and become slimy, and the bark peels from the trunk at soil level. Infections located above the ground level ooze reddish-brown resin. Cankers--dead areas of bark--can partially or completely girdle the tree trunk, which causes chlorosis of the foliage, leaf and fruit drop, stem dieback, and eventually the death of the tree. There is no treatment for Phytophthora. Plant trees with the bud union above the ground, and they should not be wrapped or mulched.